I was teaching a course last week on exercise adherence to a bunch of up and coming personal trainers and wellness coaches. On one of the breaks we were chatting about our own personal workouts and how we liked to train. I typically train like a bodybuilder, but don’t compete. I can’t do certain exercises because of old sports injuries. One exercise in particular I have trouble with is squats. I have three compressed discs in my lower back so heavy squats are out of the question. Light squats are fine but nothing like I could do when I was younger. When I mentioned this to the trainers one of them immediately spoke up and asked how my legs were so big if I didn’t squat. The answer was easy and with the trainers in the room I thought they would have known already; heavy leg press. I definitely recommend squats as long as you can do them pain free and with perfect form. 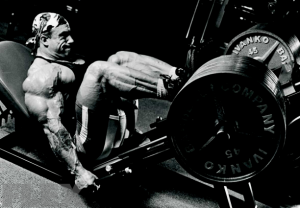 Even 6X Mr. Olympia Dorian Yates had to give up squats in 1986 because of a hip injury and he was able to build Olympia caliper quads with leg presses. That conversation really got me thinking about the difference between machines and free weights and the stigma around them. Many in the bodybuilding and some of the extreme fitness sports and even some personal trainers advocate for free weights and free weights only. Some state that machines are only for beginners. These stereotypes are becoming less and less but they do still exist. Some state that machines are safer and easier therefore you can’t get as good of a workout or the same results you would as if you used free weights. Free weights are more dangerous but you get better and faster results with them for various reasons we will explore. But first the definition of a machine. The machines in a weight room are simple machines, levers, pulleys and incline planes for the most part. We as a society have invented machines and continue to invent machines to make work easier. We don’t tend to invent things to make our lives more difficult. The difficulty of a machine exercise is very congested and I will talk about that in part two of machines vs free weights. Today we are going to talk about the safety of machines. Are machines in the gym safer? They are technically, in theory safer, but that doesn’t mean you can’t get hurt by using a machine, especially if you use it incorrectly. This is a classic youtube video. You can see as soon as he spreads his feet apart a little things start to go wrong very quickly. In most machines You probably won’t get crushed to death if something goes wrong. But you can still get hurt, like we saw in the above video. You need to be properly set up in the machine, have correct alignment, still use proper form, keep your abs tight, do the movement slow and controlled and use a weight you can lift for your desired number or reps and sets. Machines fit average size people and they have adjustments on them (seat, back, chest pads and handles depending on the machine) that need to be adjusted on them properly so you fit in the machine correctly. If you are not in there properly you can increase the joint torque stress on certain joints or put your body in compromising positions. If this happens you can end up fighting the machine for range of motion. Not literally fighting it but if your body wants to move in a certain direction because it is designed to move that way, and the machine prevents you from doing that, and forces your body in a different range of motion, you will be fighting against the machines motion. Even if you are off by a little in your alignment (depending on the machine) you can be working against a force you won’t win against. I have seen a few people using machines that lost the fight. It is usually a quick snap or pop as your body gives into the machines aliment and forces a limb to go the way it wants it to go. If you are lined up properly but you start to contort your body to move a heavy weight you can’t move with proper form, again you can be putting your back, knees, hips and elbows out of alignment and causing undue stress on those joints. Don’t think that leaning into the peck deck and using momentum and your abdominal muscles to move the weight is going to build you a bigger chest. If you don’t know how to use the machine, seek to understand before attempting to use it. This guy should really get an orientation to the gym before touching anything. I am a professional trainer and there are many like me in gyms around the world that love helping people and want to see people safe. Come find us if you don’t know what you are doing. We can show you, it will keep you safe and make your results faster. Free weights can be dangerous too, especially if you don’t have a spotter, or again if you have no idea what you are doing. There are many youtube videos out there of people getting hurt doing free weight exercises completely wrong. A missed step, bad set up, no spotter, things can go wrong quickly. The good thing when it comes to free weights is that you define the range of motion and the path the weight travels in. If you have injuries or other restrictions you can change the exercise ( as long as it is still biomechanically safe) so that you still get the benefits of the exercise. You do have to have proper form when using free weights, strong stabilizer muscles and be set up to execute the exercise properly, if not you can suffer an injury. If you are having difficulty completing the last one or two reps of a free weight exercise, hopefully you have a spotter that can help you out before things go wrong. Worst case (except in barbell bench press) you are able to “dump” the weights before you get injured. It makes a loud noise but scaring people is better than a serious injury. When it comes to the safety aspect of machines vs free weights, I am in favor of using both. I use both in my personal exercise programs and when training clients. One is not necessarily safer than the other, you can still get quite injured doing both. The unfortunate thing is the false sense of security people get when using a machine. Uninformed people think that the worst injury in a gym is having weights dropped on you. 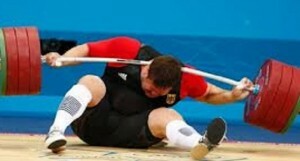 When bad form and technique can lead to acute and chronic injuries. The important thing to remember is to have proper instruction on how to use the machine or how to perform the free weigh exercise properly. With proper set up and instruction anything can be safe. In Machines vs free weights part 2 I will talk about the effectiveness of machines compared to free weights in building strength and muscle. ← Can technology help us on our fitness journey?